Interested in breathing new life into metal items of worth, combating the excesses of consumer culture and reducing waste? Do you have worn or damaged (metal) items of some intrinsic value in need of repair? Join skilled blacksmiths & tradesmen from the Artist Blacksmiths Association NSW (ABA NSW) who will be on hand to apply some of the practical skills that are held in the community, to restore and repair items that are broken or damaged. 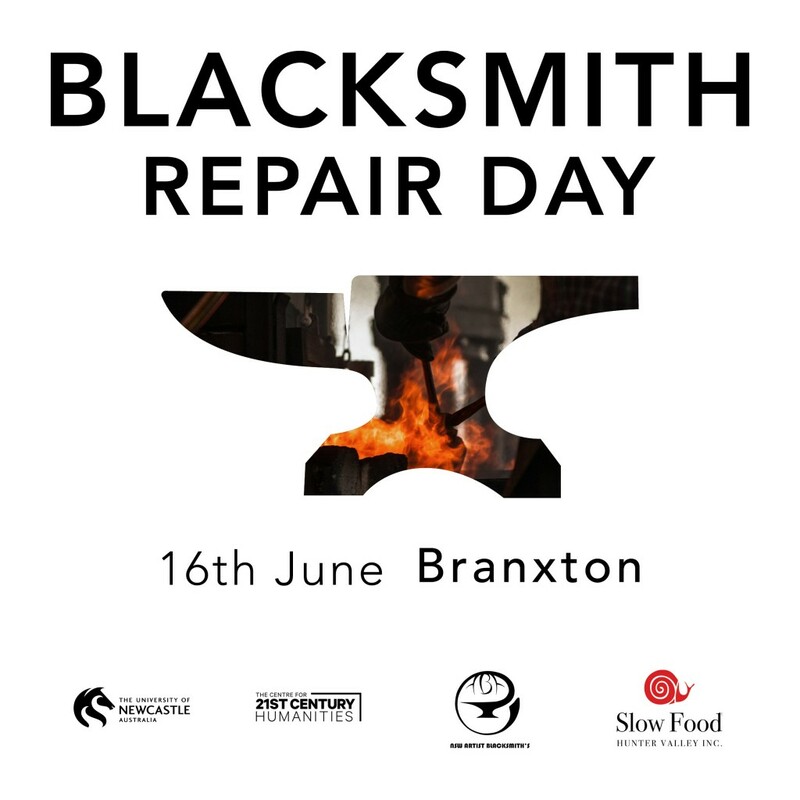 Everyone is invited to the Blacksmiths Repair day at blacksmith Will Maguire’s workshop in Elderslie, (just outside Branxton). A day long celebration of repair and a display of forged ironwork by skilled volunteer blacksmiths and proudly supported by the University of Newcastle. A delicious, local, seasonal lunch and refreshments will be provided by slow food hunter valley volunteers. A donation of $5 for lunch and $2 for refreshments. Generally, iron or steel objects of some inherent value. Hand tools such as garden tools, shovels, forks, mattocks etc, hammers, axes or adzes, pry bars, spud bars etc these can have their working edge/face forged out and dressed and heat treated, bars can be straightened and re pointed, items can be welded etc. Household items: re-attach saucepan handles, or repair utensils, weld or straighten frames, brackets or handles, brazing of cast iron may be possible but will depend on item. Farming equipment, straighten bent parts etc see hand tools (above). Decorative objects. Quality ornamental ironwork such as candle holders, recipe holders, plate racks etc. We have forging and fabrication facilities so will be able to forge, weld, braze, solder, grind, rivet, bend/straighten, heat treat etc. Time will be limited so unfortunately, we will not be able to take on large repairs and will be limited to 2 repairs per person. A small donation for each repair will be asked, with all donations going to Slow Food Hunter Valley to help educate kids on the value and source of their food. Please call or email in advance to discuss the suitability of your repair job. Items will be taken as they arrive and repaired based on the availability of our skilled volunteers. All are welcome, bring your broken item or just come for a cup of tea and a chat.